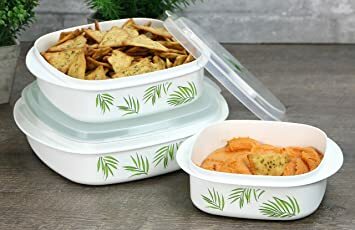 On Amazon.com you can now get this Corelle Coordinates by Reston Lloyd 6-Piece Microwave Cookware, Steamer and Storage Set for just $8.39 (regularly $11.99)! These lightweight and BPA free set goes from freezer to microwave to dishwasher using only one container! It includes three plastic containers with three, air-tight lids in three sizes – 16 oz, 28 oz and 40 oz. Each lid features an adjustable built-in steamer valve that is great for reheating.